Back injuries are physically, emotionally and financially troubling. They often leave victims with years of pain and discomfort, sometimes robbing you of the ability to perform the most basic daily tasks. 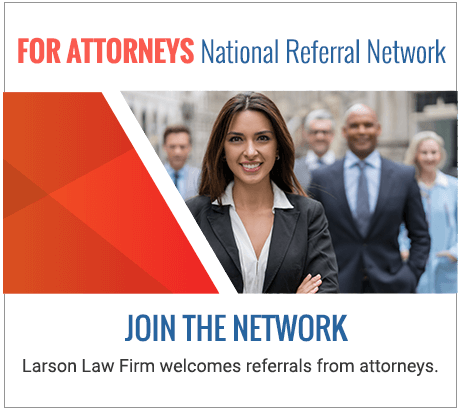 At Larson Law Firm P.C., we have helped numerous individuals secure the compensation they need to effectively treat back injuries caused by someone’s negligent acts. Our experienced North Dakota back injury lawyers understand the high cost of dealing with a back injury, so we work hard to obtain an award that sufficiently covers the financial challenges of your injury. What accidents can lead to a back injury? Of all the serious injuries you could sustain, a back injury can be the most debilitating – and the most frustrating. Our lawyers have the knowledge and skill to fully investigate the cause of your injuries and hold responsible parties accountable for their negligent and reckless actions. Whiplash. Whiplash is caused by the quick and extreme movement of the head that often occurs during a vehicle accident or blow to the head. The force of the movement can cause conditions ranging from minor discomfort to excruciating pain and a limited range of motion. Herniated discs. When one of the springy cushions between the individual bones of your spine becomes injured, you may experience intense pain or numbness in your limbs. Spinal cord injuries. Spinal cord injuries are extremely serious conditions that can result in partial or complete paralysis. Victims of a spinal cord injury may require months or years of medical treatment and rehabilitative care to handle daily necessities. Lower back strain. A lower back strain can result from such incidents as a violent vehicle crash. When the impact of the crash causes your body to jerk, the force may place too much pressure on the back muscles, resulting in a strain. The attorneys of Larson Law Firm P.C. are proud to represent clients in Minot, as well as those throughout Ward, Williams, McKenzie, Pierce and Mountrail Counties. Our office is located in Minot, and you will find easily accessible parking. If you or a family member has suffered a back injury caused by someone else’s negligence, complete our contact form or call us toll free today at 701-484-HURT to schedule a free consultation.